where to start, where to start?! How about with this: If school camps had been this fun i would have WANTED to go! 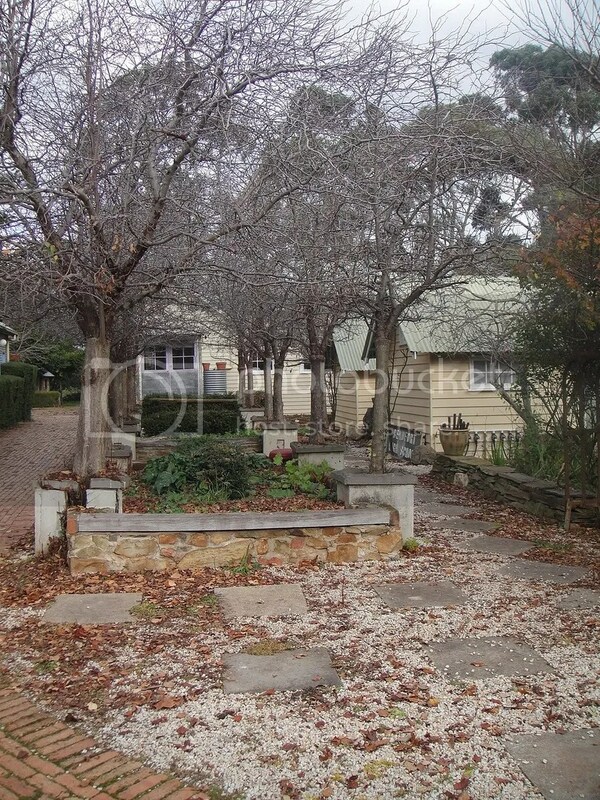 I arrived at Tasma House in Daylesford at around 12.30 and was one of the first non-organisers there. I was lucky enough to be staying in the main house, so was shown to my cosy room, made a cuppa and settled in to knit! Jules, Amy, Nandie, Katie and Chelsea, our organisers were all about and people began to drift in… There were some familiar faces – Jackie, Sarah, Emma, Kris, Jen – some I’d seen once or twice at bendi – Mel – and a lot of knitters i’d never met – One wasn’t even on Ravelry!! The atmosphere was great, everyone willing to jump in and help out, share their knowledge and expertise and listen to other’s stories and experiences. Jules was pretty quick with the handing out of Goody Bags, and imagine my surprise when the first thing handed over was a set of blocking wires! 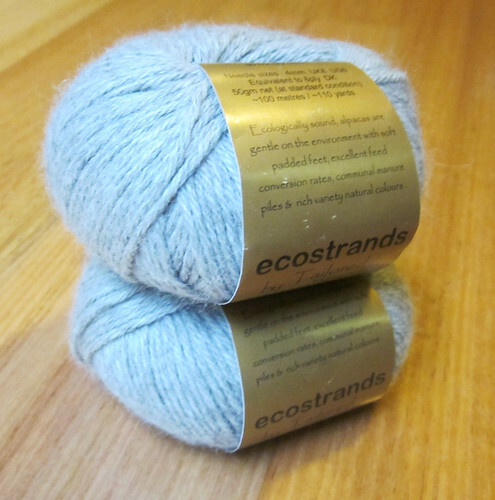 with more and more handspun wanting to be shawls, these were just the best present! 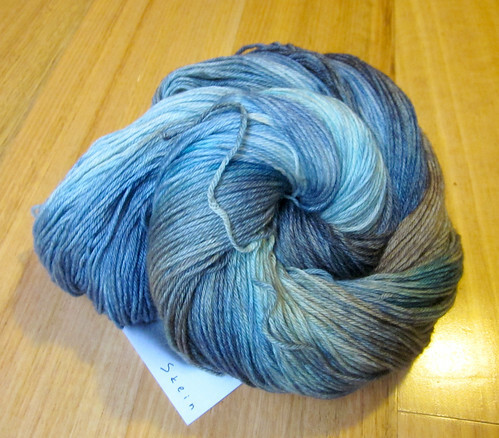 The other serious highlight was the complete skein of Skein Merino/Cashmere in the most Jen colours! Goody Bag - calico bag, blocking wires, badges, highlighter tape, skein yarn, ixchel yarn, soak wash, colour shade card and patterns from Jennifer Adams! Friday afternoon saw most of us head off to the Creswick Woolen Mills (even though they process as much Alpaca than wool these days!) . We were greeted by these food-oriented Alpacas! (Photo courtesy of Mel via Flickr) They unfortunately were not the sort to be patted by strangers (though happy to test us as edible with a little nibble!). I will aim to find some decent photos of the mills themselves from the few i took on my phone. can you believe i forgot my camera! We were given a little talk about the processing at the mill – from raw fleece to singles and then had the chance to shop (socks for papa!) and have a bit of afternoon tea. We then headed over to Tailored Strands Alpaca Farm, where we got to feed some gorgeous (slightly more friendly) alpacas, and feel up some beautiful alpaca yarn (some of it maybe fell in my bag). The alpacas were adorable and one was a particular greedy guts and ended up spitting up on Jules’ foot! good thing she was wearing crocs, but it was a bit gross! still Narelle (the alpaca) went in for more food! 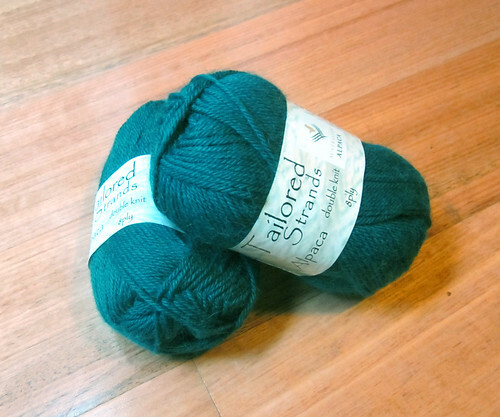 The yarn was far safer for us city knitters, and there was a beautiful selection of 4ply, 8 ply, 12 ply, boucle and brushed alpaca in a range of colours for us to purchase at a slightly discounted price! The schedule for knit camp was pretty relaxed. As the first camp, there were no ‘outside’ teachers or guest speakers, it was all guests sharing their knowledge. Saturday morning saw us over in the barn with Kylie of Ms Gusseting yarns and Heather talking about natural dyeing. Given we’d woken up that day with no water (it was off to three or four blocks until 3!) there was no dyeing ourselves, but Heather had fantastic info about natural dyeing, particularly with Eucalypts, while Kylie gave us great insight into her chemical dyeing processes. 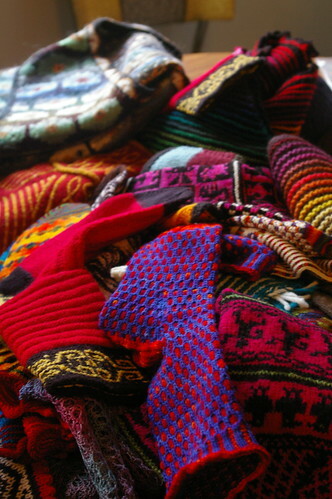 We also got to fondle a bunch of yarn and fibre that she’d brought up with her to dry in front of the pot-bellied stove! 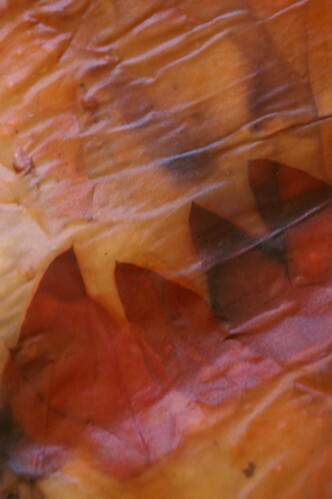 Impression of Eucalypt leaves on Silk (It used to be white!) - photo thanks to Jules. After a delicious lunch of Pies(!nom), we were treated to a demonstration of Portuguese style knitting. I didn’t even know this was a thing! I really like it and i think that if i want an alternative to English style, this might suit me better than continental style, especially for colourwork. I intend to try it out with my next stranded project! The trick will be stranding the floats LOOSELY! Thanks Amy for the demonstration! Speaking of colourwork, Sue (riotousassembly), designer and wollmeise lover, shared with us her extensive experience working with colour. she even provided notes! the best bit was seeing her examples of different kinds of colourwork, some mocked up especially for us, but some from her knitting life. Inspirational! On saturday night i had to head back into Melbourne (which at least meant i could feed the cats and save on boarding!) so i missed two significant events (and that’s not including dinner)! 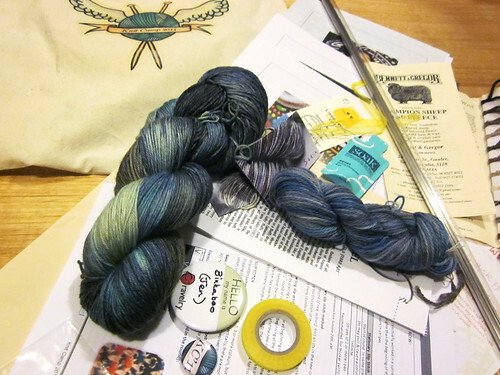 I was absent for the Stash Swap, which was by all means quite exciting not because knitters were keen to GET stuff, but because they wanted to give stuff away! I also missed Katie’s trivia night! which you can probably imagine left me feeling very miffed! I do love me some trivia! Sunday was lovely and relaxed (my errand being over!) With very informal chats/talks from Katie and Sue. Katie talked us through all her beautiful shawls she’s been churning out, discussing construction styles and yarns and things to note. Sue talked to us all again, this time about her experiences of pattern writing. Great info and again really inspirational! lunch was delicious soup, warm and hearty and the day was spent chatting and knitting. People started to pack up and drift off throughout the day, some wanting to make sure they drove while it was light, others wanting to get home to family, but it was pretty clear everyone could have happily stayed for another day or ten! At 4.30 I hopped in the car and was home just after 6 to be greeted by 2 very sooky cats. I’m just checking everyone is happy for me to post the group photo here… so check back in a few days to see everyone there! It was absolutely fantastic and my only regret is that i couldn’t completely relax due to commitments back here in town. I would definitely recommend going (and might go myself depending on where i am) next year. It was so lovely to meet people who expected nothing of you except that you had a good time, and were so willing to share, help and listen. Thanks to everyone there for making it awesome and especially to the lovely organisers for making it happen!